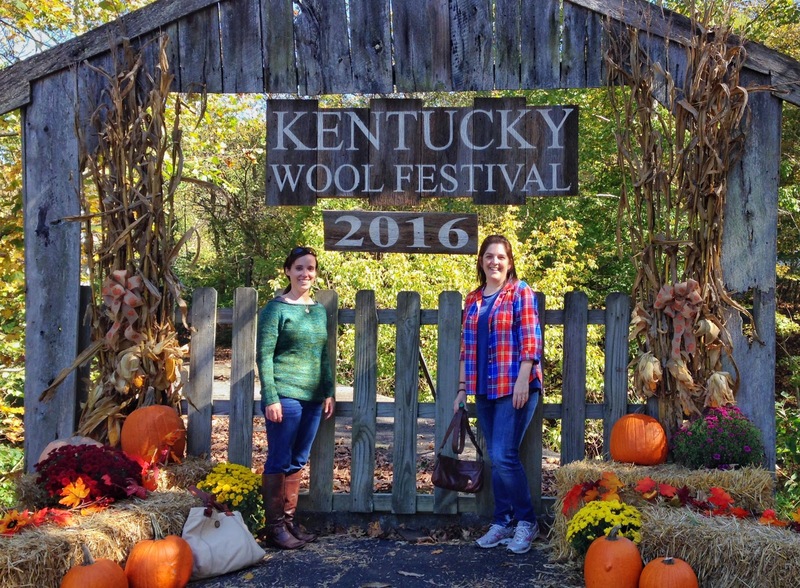 On Saturday, Kathy and I made our first visit to the Kentucky Wool Festival. Neither of us had any idea what to expect, since we'd never been to a sheep/yarn/wool festival before! She picked me up late morning and we navigated miles of winding country roads while listening to a bluegrass radio station (because Kentucky) and The Nightmare Before Christmas soundtrack (because October). The last half mile of our drive took almost 40 minutes as we joined a lonnnnng queue of vehicles trickling into the parking fields outside the festival grounds. As much as I hate traffic, this is when I started to get really excited... clearly, Wool Fest is THE thing to do in Falmouth, Kentucky. After parking, we entered the festival grounds and made a quick stop at the restrooms (labeled Rams/Ewes instead of Men/Women) and the gift shop, where we bought shirts with the adorable Wool Fest 2016 logo. Wool Fest had 4 different areas: food, craft tents, demonstration booths, and the sheep/wool tent. There were also a couple stages featuring bluegrass bands. We ate lunch and discussed our plan of attack for the almost overwhelming number of tents. Then, with our bellies full of brisket, we wandered through the craft tents and enjoyed looking at all the beautiful pottery, interesting jewelry, and fun holiday decorations. Outside these tents, we walked past a row of booths set up for different craftsmen demonstrating their skills. We saw a blacksmith, two women cooking animal fats to make soap, a guy teaching kids how to throw a hatchet, and a tanner with all sorts of interesting furs and skins. Finally... what we came here for: The Wool Tent! And it did NOT disappoint. Half of this tent housed various livestock including sheep, alpacas, cows, roosters, goats, a donkey, and pigs. The donkey and roosters were quite vocal! The other half of the tent was full of booths selling everything from bags of unprocessed wool to hand dyed yarns to finished hats and scarves. Many of the booths were demonstrating different steps in processing wool. This woman showed us how to use a carder, which combs bits of washed fleece into a little roll that can then be spun into yarn. Almost every booth had a spinning wheel on display also! A few were in use making beautiful hand-spun yarns. Kathy and I both purchased skeins of yarn from Ashley at Neely's Knits. I am going to attempt my first pair of socks with a Harry Potter-inspired colorway called Chocolate Frog! Kathy bought a really pretty skein of Game Of Thrones-inspired wool/silk blend called Winter Is Coming. I've had Wool Fest on my calendar for almost a year, and I'm so glad we were able to go! We enjoyed beautiful weather, delicious food, and fun souvenirs. I got several compliments on my Breakwater Sweater (of course I had to wear something handknit)! I can't wait to start working on my first pair of socks! I can't believe you haven't knit socks yet! I know! I also have no hand knit scarves. What's wrong with me? ?